The Evangelical Alliance has announced that Steve Clifford, its general director, will step down from his role at the end of 2019. Steve has been at the helm of the Evangelical Alliance since April 2009 and over the past decade he has helped the church have confidence in the power of the gospel and develop a clear voice in public life. But, perhaps above all, the Bradford-born Christian leader has brought together the diverse evangelical communities in the UK, so that together, despite differences, we can all make Jesus known. Commenting on his decision, Steve Clifford said: “For the past 10 years it has been an honour and privilege to work alongside an amazing team of people within the Evangelical Alliance’s staff, board and council, as well as so many leaders from across the wide traditions of the evangelical world. The great John chapter 17 prayer of Jesus has echoed in my ears as we have sought to express our ‘oneness’ with the missional imperative ‘that the world might believe’. For me, our strapline says it all: ‘Together making Jesus known’. “The years have not been without their times of challenge, but the Evangelical Alliance has come through stronger and with a deep commitment to serve God’s church right across the UK. Steve’s involvement in the Evangelical Alliance stretches back many years, having previously served on the Evangelical Alliance’s board and council. Over the decade that he has been general director, the organisation has seen significant changes in its structure, moved its headquarters, and increased its impact and influence. Steve has dedicated much of his work to building unity across different ethnic expressions of evangelical Christianity in the UK. In 2010 the South Asian Forum of the Evangelical Alliance was launched to support engagement with South-Asian Christians in the UK and ministry to communities from that heritage. In 2010, at the Evangelical Alliance’s council, a significant challenge was brought to the leadership as to whether more could be done to promote greater ethnic unity. This prompted the formation of the One People Commission (OPC) with senior leaders of churches in ethnic minority communities around the UK. This brought together African and Caribbean leaders along with Hispanic and Chinese pastors. Since its inception in 2013, leaders from other communities, including Iranian, Korean and South-East Asian communities, have also joined. It has become increasingly clear from the relationships built through this work that unity is possible and ethnic diversity is good. John Risbridger, chair of the Evangelical Alliance council, and minister and team leader of Above Bar Church, Southampton, said: "A bridge-builder, courageous leader and friend to so many, Steve has led the Evangelical Alliance through times both of opportunity and of testing with conviction, wisdom and grace. We thank God for him and are deeply grateful to him and Ann for all they have brought to the evangelical community over the past decade." The work of the Evangelical Alliance in encouraging mission across the UK has flourished under Steve’s leadership. 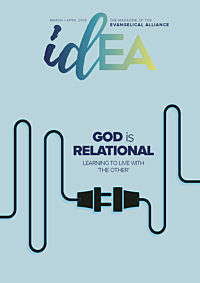 This has included catalysing in-depth research about the state of evangelism in the UK and the launch in 2016 of the Great Commission hub to resource Christians for evangelism by connecting them to more than 200 resources and sharing testimonials, through high-quality videos, of how people came to faith. Steve’s heart for unity among evangelicals in the UK has flowed into everything that the Evangelical Alliance does, as has his ongoing, long-term commitment to serving the UK church. In 2012 the Gather Network was established to identify and catalyse local unity movements in towns and cities across England. The initiative continues to help churches across the nation work together in mission and demonstrate what God can do through our prayers and relationships. Through Steve’s leadership the Evangelical Alliance has continued to invest in the younger generations of the church. Over the last few years this has included initiatives such as the Public Leader courses in Scotland, England and Northern Ireland, the OPC young leaders’ forum, and an increased focus on mission to young adults, with a new post of ‘head of mission to young adults’ created in 2018. The Evangelical Alliance will shortly begin the search for Steve’s successor. We are the Evangelical Alliance. We join together hundreds of organisations, thousands of churches and tens of thousands of individuals for the sake of the gospel. Representing our members since 1846, the Evangelical Alliance is the oldest and largest evangelical unity movement in the UK. We love Jesus and we want everyone in the UK to be given an opportunity to know Him. We love His church, and we will do all we can to unite evangelicals, building confidence in the gospel and speaking as a trusted voice into society to see it changed for Him. Working across the UK, with offices in London, Cardiff, Glasgow and Belfast, our members come together from across denominations, locations, age groups and ethnicities, all sharing a passion to know Jesus and make Him known.